Like the name suggests, Modern M0110 is based on the legendary 1984 M0110 but with a modern enthusiast-focused twist. The OG M0110 is where it all started. Steve Jobs originally designed the this keyboard by hand to be sold with the first Macintosh in 1984, which on its own set out to change the world. Jobs famously chose not to use a nav cluster, which many years later inspired Eiiti Wada to design the now legendary Happy Hacking Keyboard. The HHKB not only grew a huge following within the community, it also pushed many enthusiasts to create customs boards like the Duck Viper. 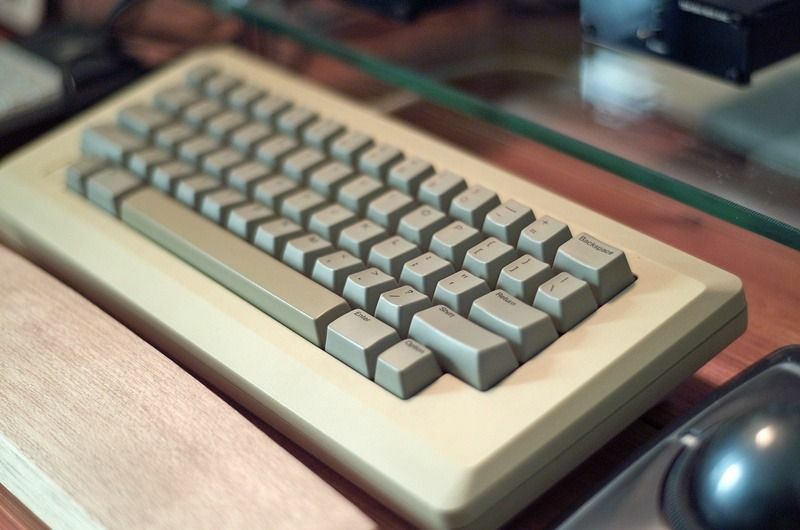 In short, no keyboard has a history like this one. Modern M0110 keeps the original iconic curves but adds some modern luxury. 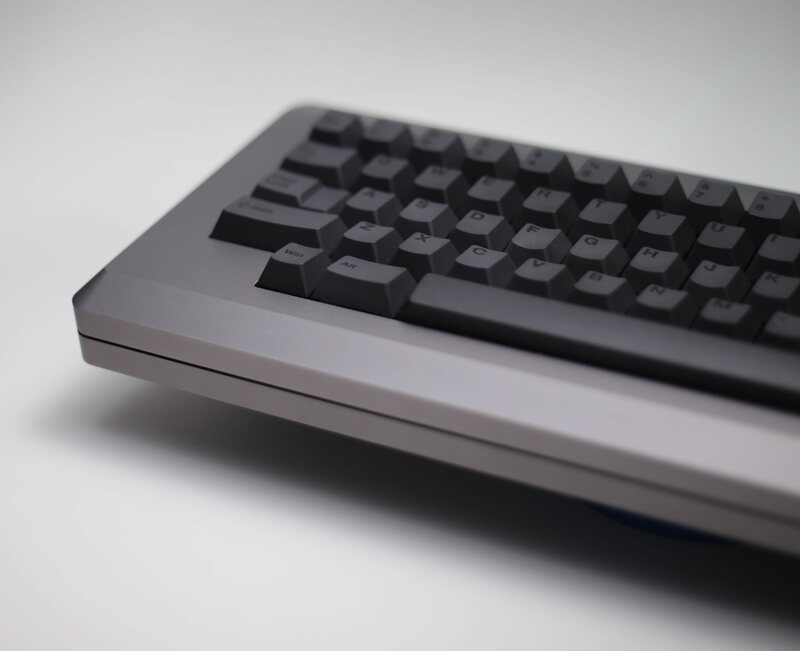 It supports standard 60% PCBs, support for both MX and ALPS switches and has a precision lasered top mounted brass or acrylic plate for the ultimate (fixed HHKB is in the works ). For Modern M0110 we proudly offer 2 surface finishes. Anodising is the smooth finish we have come to love on aluminium in the past years and will be available in a clean Silver or stealthy Grey. Cerakote is a different story, it is a very high-end finish used most on firearms for its incredible durability. We will be offering Cerakote in a classy and vintage Light Sand or a versatile Dynamic Black. Furthermore, for those who want it we will also be able to offer the entirety of the colours in Cerakote's H series line! This will allow you to find the perfect match for your favourite keyset to make this board truly next level, never has a keyboard GB had this many colour options! Just a couple cool extra bits here if you're not completely hyped out yet . If you're familiar with the original Macintosh packaging you'll sure appreciate the box Modern M0110 comes in! Designed by the talented Garrett from Dixiemech, this box gives off a stunning vintage vibe while also offering great protection during shipping because of the custom foam inserts. We are also offering custom engraving and are allowing people to reserve serial numbers, to make this board truly your own! Furthermore, there will also be a lot of complimentary items for sale along with M0110. These range from a USB C 60% PCB, foam inserts to dampen sound, a wide range of switches to a custom Cherry Profile ALPS keyset! M0110 will be distributed by some amazing vendors. Check em out below! How long will the GB be open? Until the 22nd of July! Why is the EU pricing so much higher than the US pricing? To put it short, it's a combination of expensive shipping from our manufacturer to the vendor and 21% revenue tax in the EU. We really wish we could get EU pricing lower, but sadly we already cut profit as far down as we could. If you think ordering from the US will be cheaper, feel free to hit up Deskcandy for quotes however we are not responsible for any import tax. Approval bump, and best of luck with this project! Need to convince myself I don't need more than one. Won't the foam be available at mykeyboard.eu? Oh my god it looks so nice, a part of me tells me I want it, another part of me is telling me I need an 1800 layout board tho still and a third part of me tells me to save that money instead. 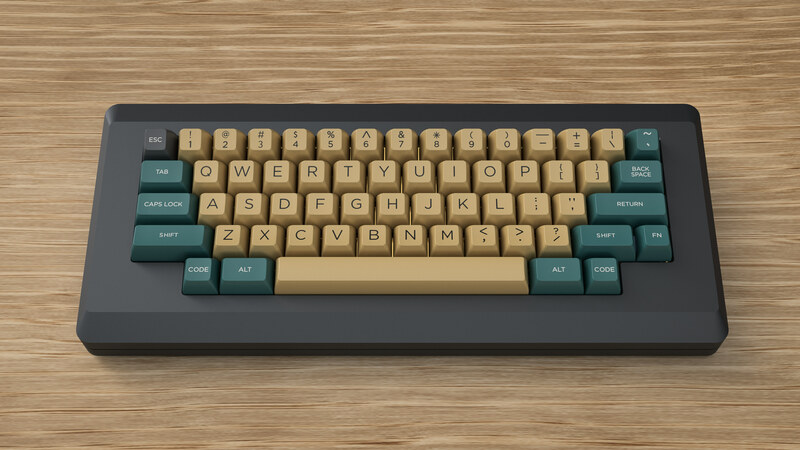 Btw thanks for the renders for GMK Shoko Janglad! Feel free to use them to promote the Modern M0110 if you want. John and David are working on adding that right now! Will the plate design be availble? Would love to have a split space layout plate. The current layouts are just not for me. Wow, thank you. Now I need to go back to my fight with the wallet. If anyone needs help with a .ai file for a custom engraving PM me and I can help design and create the file. No doubt this is answered somewhere, but what’s the angle on the board? 8 degrees? The sample Huey (TopClack) got was had a bad cerakote job. Any work on whether that has been fixed? Anything larger than a 65% is extraneous! That's really awesome from you man. Big thumbs up! Yup, we have been listening closely to Huey's feedback closely. The 2 main issues were the really bad plate and the uneven Cerakote. We already fixed the plate, which Huey now has in hand! As for the Cerakote, we're looking into that right now. We're 99% sure the unevenness was caused because it was Cerakoted twice and under rushed circumstances, however, we don't want to take any risks. John is already moving forward with our CNC manufacturer to get a couple boards done in advance, we will get these Cerakoted and basically use them as final prototypes to perfect the finish and confirm that there are no issues left! I will update here once we get to that phase for sure! Is there a gallery of all renders you made for this board? Need some color/keycap inspiration. Thank you very much. What is that SA set on the 6th image? Ah yes, I remember. What a nice combo. Will there be a gb or why did you make that render? The creator asked me to do a render for a IC, I'm not sure what the current status is of the project. I really like the set too! Is there any place where I can find the dimensions of the case? I tried searching for them, but could not find them. This and rocketeer this month. July is a good month. The case color in the 6th render is not the grey anodized version, right? This would be a custom cerakote colour? Can I ask a stupid question? What does "no switch top removal" mean in the fixed HHKB plate option? Switch top removal means you can remove the top of the switch to swap out springs and add LED if you want to do that after soldering the switches. Without switch top removal, you would need to desolder the switch to make the change. Yup! Altho you can still add LEDs later on a plate without switch top removal, right? Just slide em in from the top? Yeah, that render was made before we finalised colour options. The grey will be as close as possible to the this/the iPhone 5 "space gray"
Is there a MOQ for this GB? Will the units be still be produced if it is less than MOQ? Can't decide on which cerakote color I should get. I don't think there is a MOQ. He'll make as many as people ordered, iirc. I went with Stormtrooper White H-297Q . I don't have a white board in my collection. Is there an update to the reserved Serial Number list? Would be helpful to know which ones are taken! I'll ask John, will report back! Is it possible to choose the "Fixed MX HHKB (no switch top removal)" plate ordering from mykeyboard.eu? The spreadsheet on the product listing page is up to date as of posting this message Thanks! Minimum line size is my biggest question, I need to know how fine of detail the engraver can engrave, I have some designs people are requesting that are fairly intricate and I don't want to send them a file that can't be produced. Can we do engraved lines as fine as .3mm? Hi I have a question about the plate. Is it possible to have a "mini" enter and US-like pipe/ backslash? So like splitting a ISO enter in the middle or would that require a custom plate? Also how much would the shipping to germany be? MyKeyboard sadly does not offer Matias switches or the wrist rest and the stabilizers are much more expensive. Could you share a picture of the specific layout you mean? As for the shipping, please contact Candykeys for a shipping quote Thanks! Sure, it's the fifth row from the top in this picture https://www.deskcandy.xyz/group-buy/xd60-v30 and i didn't know candykeys are involved with the project but thanks will do that. Just checked the plate file, and yes that layout should work. Altho I would suggest using a PCB mounted switch for the enter key. Might be a silly question.. but i’m wondering how many have been ordered so far? (Estimate?) and are there any plans for a 2nd round? On Top Clack, Heroyjenkins mentioned they sold "over 100 so far"